We already saw just what a curious, playful little droid BB-8 is from his role in Star Wars: The Force Awakens. But the question on everyone’s mind in light of this week’s reveal of his new evil twin BB-9E Murderball has been what’s going to happen when the two rolly boys finally meet in The Last Jedi. 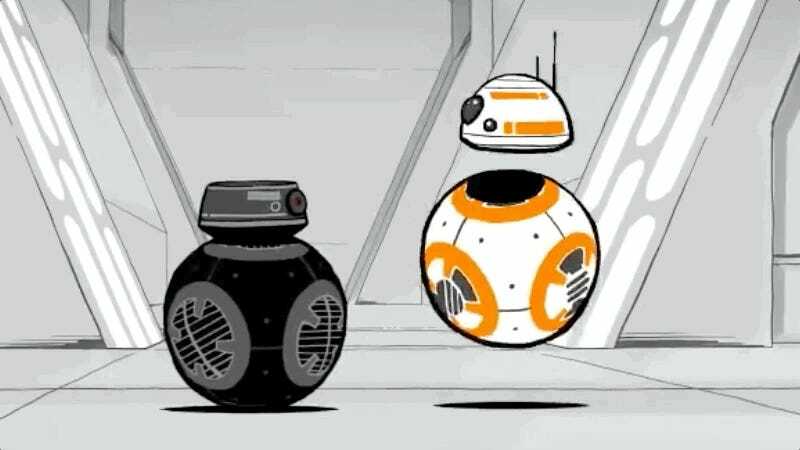 In a new animated short the Star Wars team posted to Twitter today, an excited BB-8 is shocked to meet his darker self and, as all good droids are wont to do, he proceeds to bug the hell out of Murderball because he just wants to play. My kingdom for a whole series about these two adventuring through the galaxy and getting on one another’s nerves.